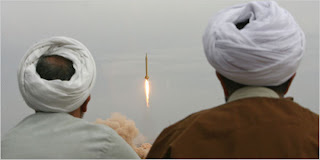 The Folly of Attacking Iran: Lessons from History. 2-11-08. Hedges: It's Insane to Attack Iran, Devastating Consequences. 5-31-08. This selected bibliography of articles is listed by most recent date. Hersh, Seymour M. Preparing the Battlefield. The Bush Administration steps up its secret moves against Iran. The New Yorker, July 7, 2008. Parry, Robert. Iran-Contra’s ‘Lost Chapter.’ Consortiumnews.com, 6-30-08. Raimondo, Justin. Don’t Wait for World War III. Act now to stop it! Antiwar.com, 6-30-08. Mother Jones Blog. Iran Panic? Talk About It With the Experts. MotherJones.com, 6-28-08. CBS. Israel Prodding U.S. To Attack Iran. CBS News, 6-24-08. McGovern, Ray. Iran attack coming soon. Rawstory.com, 6-22-08. Bomb Iran? What’s to Stop Us? Antiwar.com 6-20-08. Peterson, Scott. How Iran would retaliate if it comes to war. The Christian Science Monitor, 6-20-08. Porter, Gareth. Attack Iran? Cheney’s Already Tried. IPS News, Alternet.org, 6-10-08. Jerusalem Post. White House denies Iran attack report. 5-20-08. Progress Report. Lieberman Says Bombing Iran ‘Has An Appeal To It.’ Thinkprogress.org, 5-14-08. Cockburn, Andrew. Secret Bush ‘Finding’ Widens War on Iran. Counterpunch.org, 5-02-08. Dreyfuss, Robert. Shirin Ebadi: Don’t Attack Iran. The Nation, 4-29-08. Brecher, Jeremy and Brendan Smith. How the Military Can Top an Iran Attack. The Nation, 10-09-07. Oxfam. Military attack on Iran would have disastrous consequences warns new report. 2-05-07. Dreyfuss, Robert. Next We Take Tehran. The confrontation with Iran has very little to do with nukes—and a lot with the agenda of empire. MotherJones.com, July/August 2006. Porteous, Tom. Bush’s Unanswered Letter. TomPaine, 5-12-06. Brecher, Jeremy & Brendan Smith. Attack Iran, ignore the Constitution. The Nation, 4-21-06. National Security Archive. The U.S. Tilts toward Iraq, 1980-1984.” National Security Archive Electronic Briefing Book No. 82. Edited by Joyce Battle. February 25, 2003.